Set up your computer to boot into Windows 10 or Ubuntu 18.04 as needed. Even though Linux is a great operating system with widespread hardware and software support, the reality is that sometimes you have to use Windows, perhaps due to key apps that won't run under Linux. 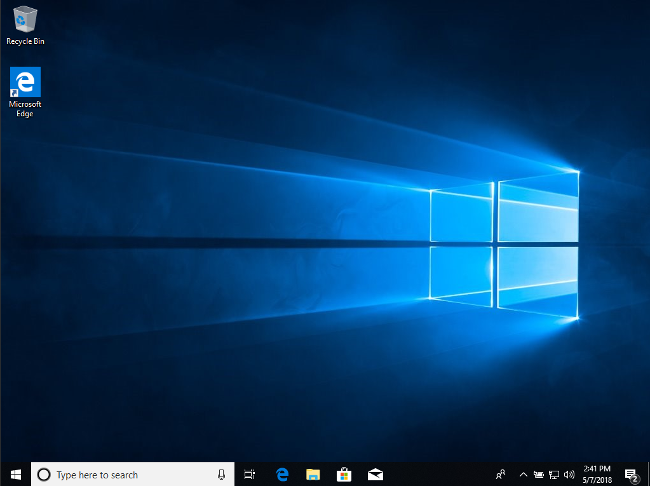 Thankfully, dual-booting Windows and Linux is very straightforward—and I'll show you how to set it up, with Windows 10 and Ubuntu 18.04, in this article. Before you get started, make sure you've backed up your computer. Although the dual-boot setup process is not very involved, accidents can still happen. So take the time to back up your important files in case chaos theory comes into play. In addition to backing up your files, consider taking an image backup of the disk as well, though that's not required and can be a more advanced process. 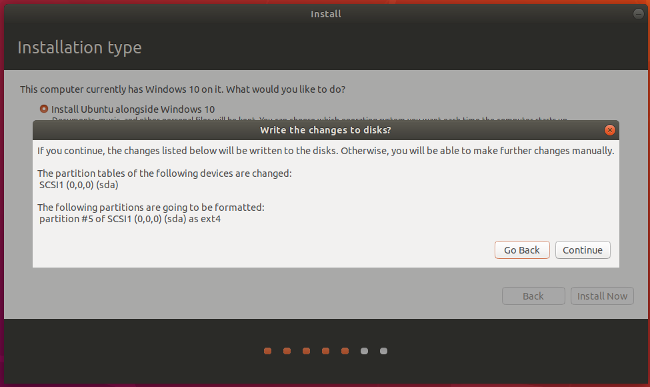 I recommend installing Windows and Ubuntu via flash drives since they're faster than DVDs. It probably goes without saying, but creating bootable media erases everything on the flash drive. Therefore, make sure the flash drives are empty or contain data you don't care about losing. If your machine doesn't support booting from USB, you can create DVD media instead. Unfortunately, because no two computers seem to have the same DVD-burning software, I can't walk you through that process. However, if your DVD-burning application has an option to burn from an ISO image, that's the option you need. If Windows 10 came with your PC, the license will be built into the computer, so you don't need to worry about entering it during installation. If you bought the retail edition, you should have a product key, which you will need to enter during the installation process. Download and launch the Windows 10 Media Creation Tool. Once you launch the tool, it will walk you through the steps required to create the Windows media on a USB or DVD-R. Note: Even if you already have Windows 10 installed, it's a good idea to create bootable media anyway, just in case something goes wrong and you need to reinstall it. Download the Ubuntu 18.04 ISO image. For creating bootable media for any Linux distribution, I recommend Etcher. Etcher works on all three major operating systems (Linux, MacOS, and Windows) and is careful not to let you overwrite your current operating system partition. There are two ways of going about the installation. 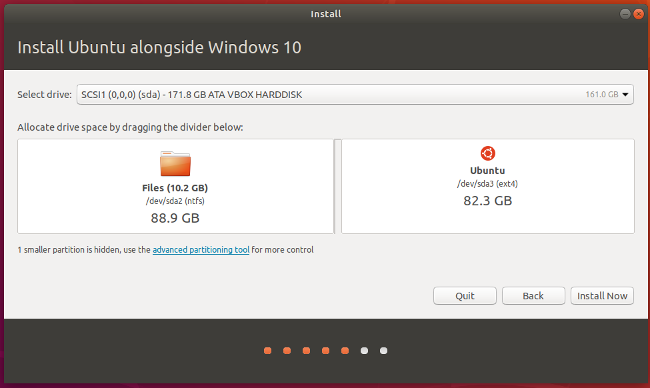 First, if you already have Windows 10 installed, you can have the Ubuntu installer resize the partition, and the installation will proceed in the empty space. 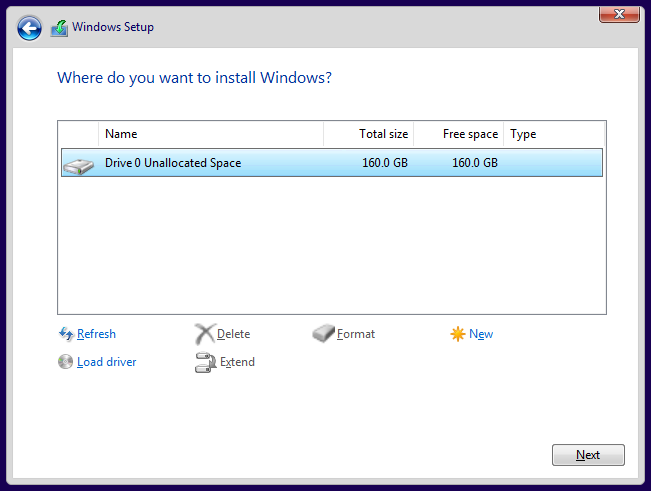 Or, if you haven't installed Windows 10, install it on a smaller partition you can set up during the installation process. (I'll describe how to do that below.) The second way is preferred and less error-prone. There's a good chance you won't have any issues either way, but installing Windows manually and giving it a smaller partition, then installing Ubuntu, is the easiest way to go. If you already have Windows 10 on your computer, skip the following Windows installation instructions and proceed to Installing Ubuntu. Insert the Windows installation media you created into your computer and boot from it. How you do this depends on your computer, but most have a key you can press to initiate the boot menu. On a Dell PC for example, that key is F12. If the flash drive doesn't show up as an option, you may need to restart the computer. Sometimes it will show up only if you've inserted the media before turning on the computer. If you see a message like, "press any key to boot from the installation media," press a key. You should see the following screen. Select your language and keyboard style and click Next. 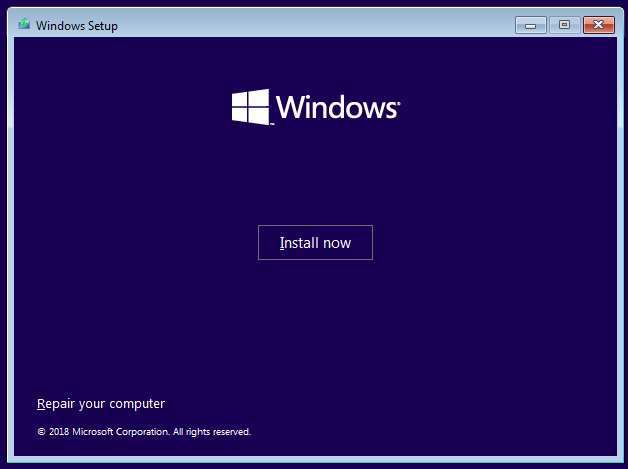 Click on Install now to start the Windows installer. On the next screen, it will ask for your product key. 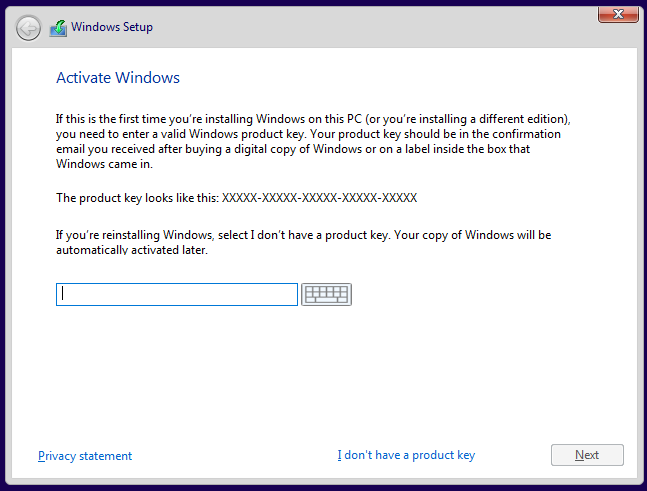 If you don't have one because Windows 10 came with your PC, select "I don't have a product key." It should automatically activate after the installation once it catches up with updates. If you do have a product key, type that in and click Next. Select which version of Windows you want to install. If you have a retail copy, the label will tell you what version you have. Otherwise, it is typically located with the documentation that came with your computer. In most cases, it's going to be either Windows 10 Home or Windows 10 Pro. Most PCs that come with the Home edition have a label that simply reads "Windows 10," while Pro is clearly marked. 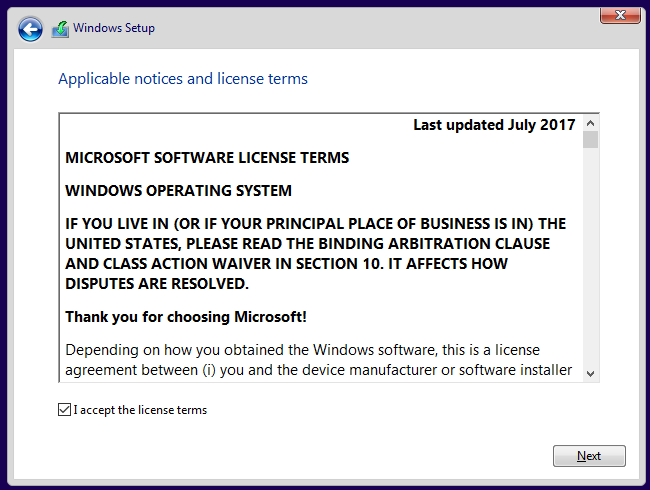 Accept the license agreement by checking the box, then click Next. After accepting the agreement, you have two installation options available. 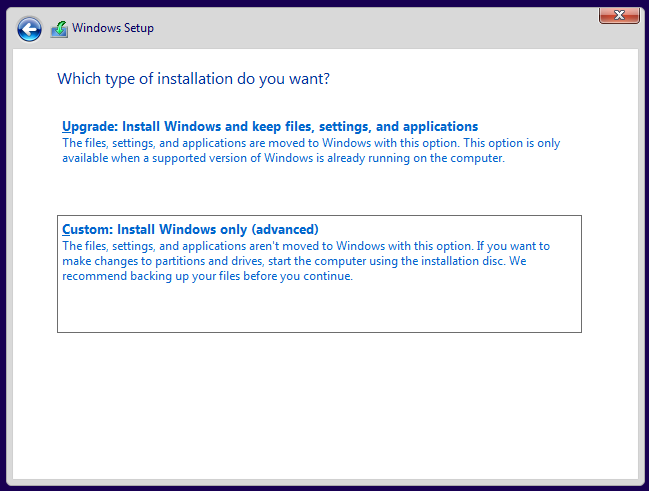 Choose the second option, Custom: Install Windows only (advanced). The next screen should show your current hard disk configuration. Your results will probably look different than mine. I have never used this hard disk before, so it's completely unallocated. You will probably see one or more partitions for your current operating system. Highlight each partition and remove it. At this point, your screen will show your entire disk as unallocated. To continue, create a new partition. Here you can see that I divided the drive in half (or close enough) by creating a partition of 81,920MB (which is close to half of 160GB). 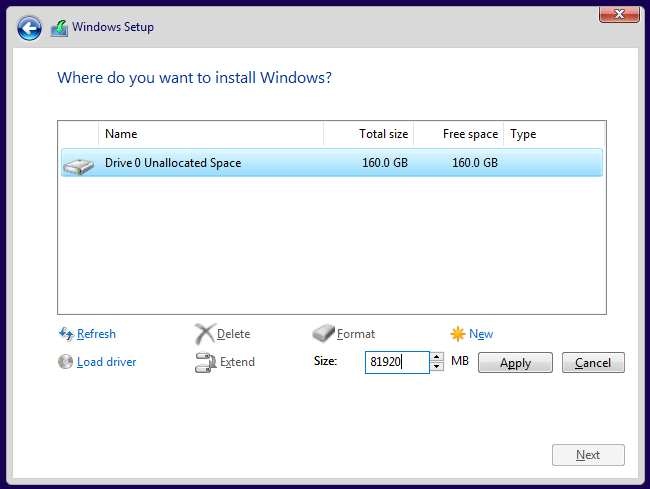 Give Windows at least 40GB, preferably 64GB or more. Leave the rest of the drive unallocated, as that's where you'll install Ubuntu later. 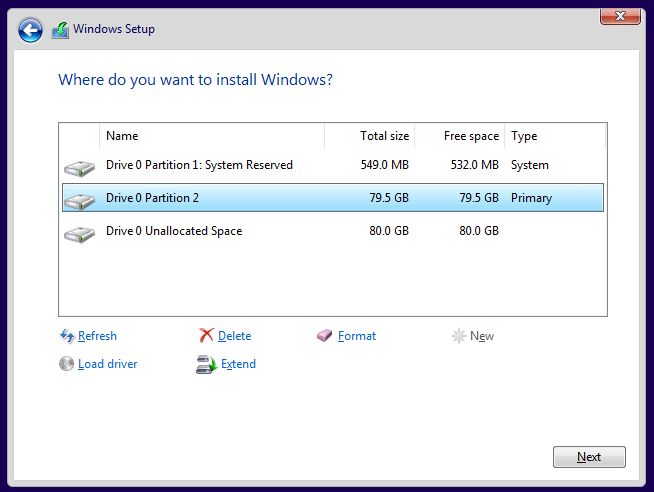 Confirm the partitioning looks good to you and click Next. 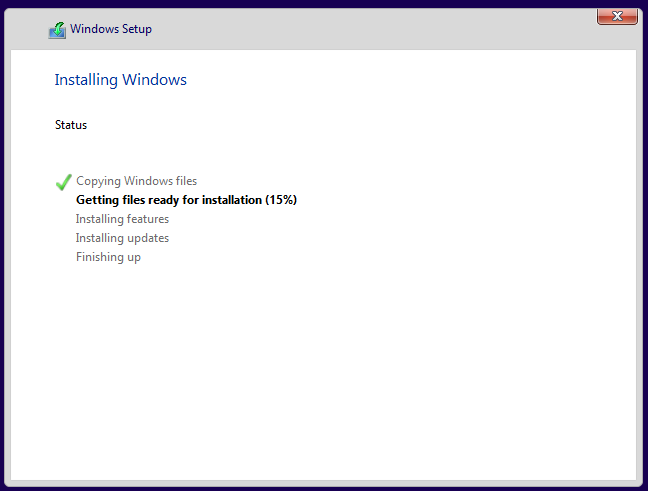 Windows will begin installing. If your computer successfully boots into Windows, you're all set to move on to the next step. 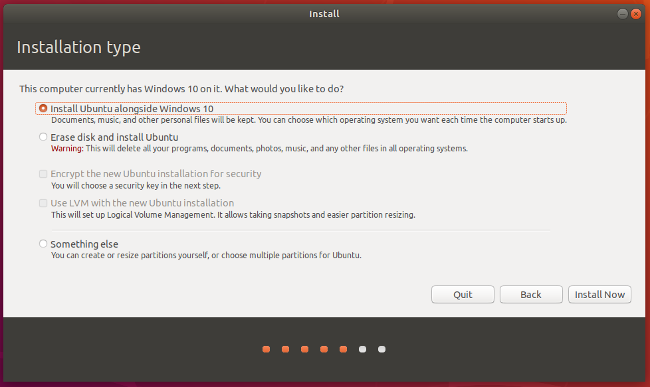 Here, you can select between Try Ubuntu or Install Ubuntu. 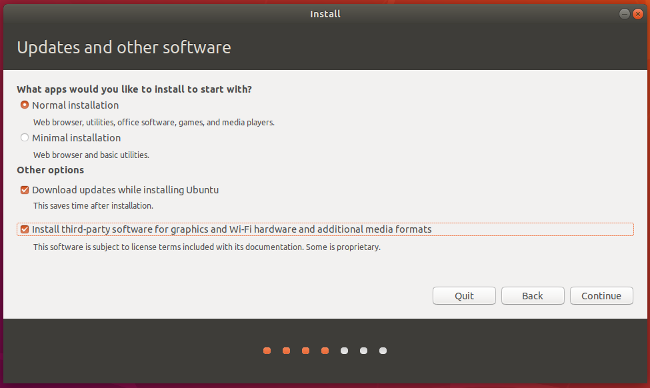 Don't install just yet; instead, click Try Ubuntu. After it finishes loading, you should see the Ubuntu desktop. 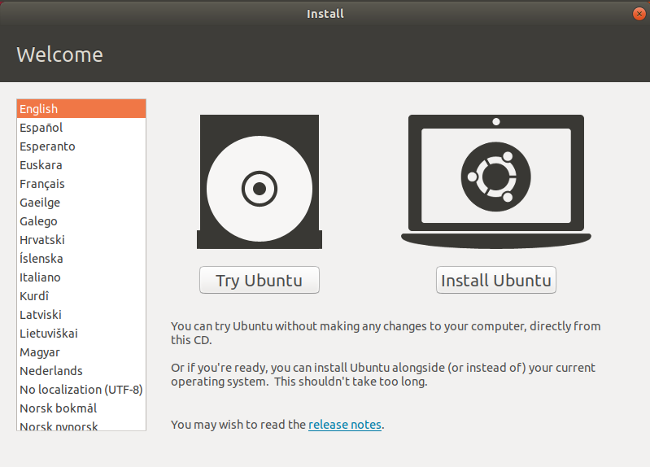 By clicking Try Ubuntu, you have opted to try out Ubuntu before you install it. 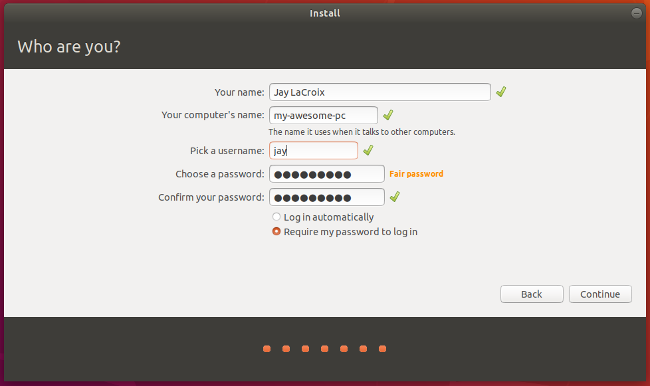 Here, in Live mode, you can play around with Ubuntu and make sure everything works before you commit to the installation. 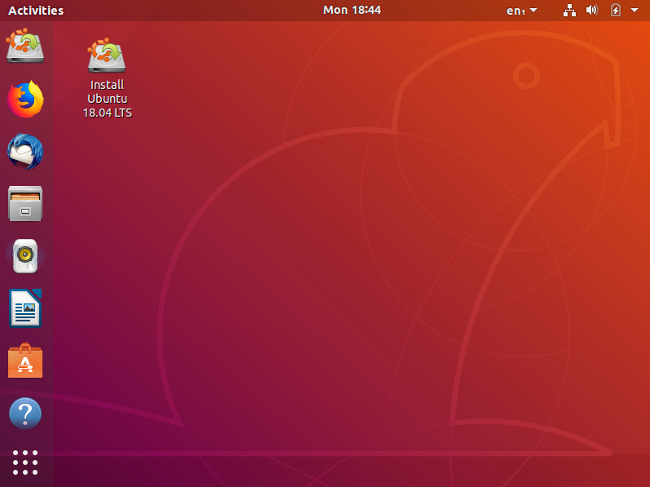 Ubuntu works with most PC hardware, but it's always better to test it out beforehand. Make sure you can access the internet and get audio and video playback. Going to YouTube and playing a video is a good way of doing all of that at once. If you need to connect to a wireless network, click on the networking icon at the top-right of the screen. There, you can find a list of wireless networks and connect to yours. Once you're ready to go, double-click on the Install Ubuntu 18.04 LTS icon on the desktop to launch the installer. 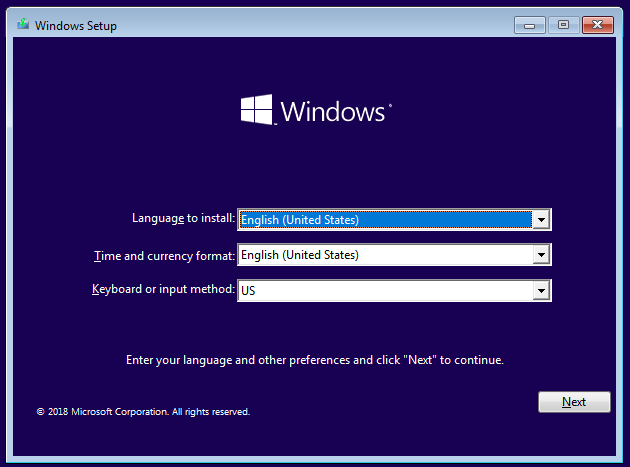 Choose the language you want to use for the installation process, then click Continue. Next, choose the keyboard layout. Once you've made your selection, click Continue. You have a few options on the screen below. One, you can choose a Normal or a Minimal installation. For most people, the Normal installation is ideal. Advanced users may want to do a Minimal install instead, which has fewer software applications installed by default. In addition, you can choose to download updates and whether or not to include third-party software and drivers. I recommend checking both of those boxes. When done, click Continue. The next screen asks whether you want to erase the disk or set up a dual-boot. Since you're dual-booting, choose Install Ubuntu alongside Windows 10. Click Install Now. The following screen may appear. If you installed Windows from scratch and left unallocated space on the disk, Ubuntu will automatically set itself up in the empty space, so you won't see this screen. If you already had Windows 10 installed and it's taking up the entire drive, this screen will appear and give you an option to select a disk at the top. If you have just one disk, you can choose how much space to steal from Windows and apply to Ubuntu. You can drag the vertical line in the middle left and right with your mouse to take space away from one and gives it to the other. Adjust this exactly the way you want it, then click Install Now. You should see a confirmation screen indicating what Ubuntu plans on doing. If everything looks right, click Continue. 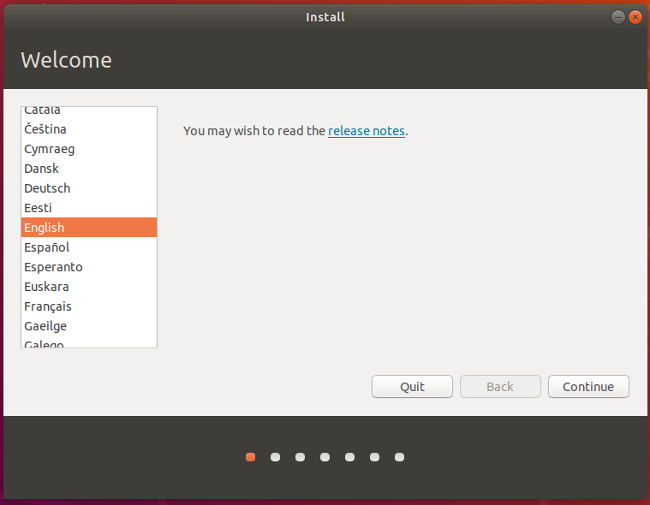 Ubuntu is now installing in the background. You still have some configuration to do, though. 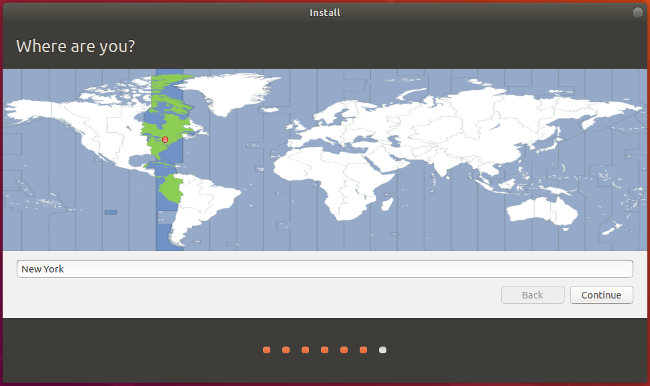 While Ubuntu tries its best to figure out your location, you can click on the map to narrow it down to ensure your time zone and other things are set correctly. Next, fill in the user account information: your name, computer name, username, and password. Click Continue when you're done. There you have it! The installation is complete. Go ahead and reboot the PC. If all went according to plan, you should see a screen similar to this when your computer restarts. Choose Ubuntu or Windows 10; the other options are for troubleshooting, so I won't go into them. Try booting into both Ubuntu and Windows to test them out and make sure everything works as expected. If it does, you now have both Windows and Ubuntu installed on your computer. I used to have at least one dual-boot machine at all times. The biggest downside is when you need some file from the other system. If you didn't think to save it to some removable media, you have to reboot, then reboot again. With a virtual machine, you can have both systems running at the same time, and use an ssh/sftp client to transfer files from one to the other. The tricky part is apportioning resources to your machine -- disk space is not so hard, but how much memory, how much of your processor(s) to spare; I can't say that I feel like I've figured that out completely. I don't know if it's a feature of the VM or not, but I find that Windows 10 seems to be constantly churning my processors, even when no program is running. It seemed better with Windows 7. "I don't know if it's a feature of the VM or not, but I find that Windows 10 seems to be constantly churning my processors, even when no program is running. It seemed better with Windows 7." That being said, I would simply use a stable Linux distro (MX-Linux 17.1, Ubuntu Mate, Netrunner, etc.) and install VirtualBox or VMWare Workstation. Then I would have a shared folder so that any Windows app data I need to access is available from there. Works extremely well. However, if you really need to have Windows installed on your machine, I'd stick with Windows 7 Professional SP1. That's the very last, GOOD Windows you will ever find. Install it on a 40 or 50GB partition and only use when you absolutely NEED to "go there" for a particular app. If you take that route, simply create a Fat32 or NTFS data partition so that you can access it from Linux. Problem solved. I only need Windows 7 if I'm doing hardware stuff (rooting Android devices, etc. due to better driver support). Even my girlfriend loves Linux and prefers it over Windows 7. These days, I'm seeing casual Windows users generally getting fed up with the task of running Windows on the desktops & laptops - especially after updates. I predict 2018 will see even more converts than previous years. Why? Because Desktop Linux is now ready for prime time. If you have your windows data on a disk, then when when booting into Linux, simply mount that disk from Linux to access the data. Linux can mount NTFS drives and can read/write to NTFS disks. I do this all the time. When done with Linux, reboot to windows, and your updated data will be there on that disk. I've seen an article describing a dual boot system, with a separate data partition that is accessible by both Windows and Linux. What do you think of that approach? It is a very good approach IF you can't run said app in VirtualBox or VMWare Workstation. If you take that route, create a Fat32 or NTFS data partition and store your "shared" data there. If you really need to install Windows on the hardware side, go with Windows 7 Professional SP1. Avoid 8 & 10. If you install Ubuntu or any other linux first and then install windows then you may need to install grub again or windows installation will make windows' bootloader as default bootloader and that will directly boot to windows without asking. What if you machine initially came with Windows 8 installed and you upgraded to windows 10, but now I want to install Ubuntu and run Windows under a VM. 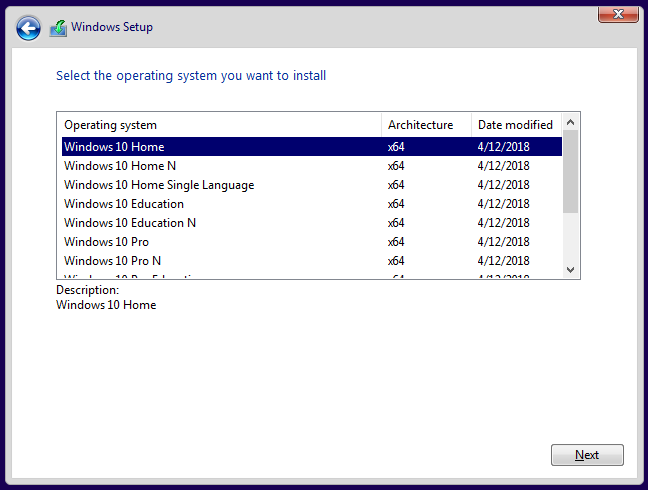 How do I get the Windows 10 product key for the install? I'm new here and want to get into Linux. I've read quite a lot about it and I'm ready to try it on for size. this would be great but what if linux(any version and brand) spits pci errors, cpu locks and wound boot and if you do a linux network install it goes well but at boot time the same issues, is there a solution for?